Photos taken by Lindsey Portugal of Lullaby by Lindsey. K and L started care with me at 18 weeks gestation during their second pregnancy. 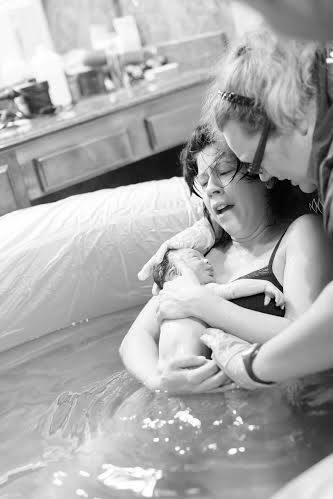 They were looking for something different in this birth experience. The day before K’s anticipated due date, she text me that morning saying she was having regular contractions that felt different. I went over to check on her around 1130 and found her to be 3cm dilated, 60% effaced and baby at a -1 station. Contractions were coming every 3 minutes initially, lasting 45 seconds. It wasn’t long and the contractions had a noticeable difference. Less than an hour from my first assessment, K was contracting every 2 minutes, lasting close to a minute. K did not have much for snacks and drinks for labor, so L went to the store to get the necessary food and drinks and I stayed with K until he returned. K had wanted to bake a cake in early labor. With contractions coming every 2 minutes, it was a longer project than originally imagined. While making the cake, K’s doula messaged and I encouraged K it was time to ask her doula to come. Her doula was headed her way. K’s doula arrived at 130, and I headed out for a bit until K was ready for me to return. Around 3pm, I arrived back. K’s was walking around the living room, contractions seemed to be coming about every 2-3 minutes. A cervical exam was done, and found K to be 5cm dilated, 90% effaced and baby low at a 0 station. Things were moving along nicely. Over the next couple hours, K did wonderful changing up her positions. She would walk her stairs, then sit on her ball, lay on her side. She did what I lovingly dub the “wild captain morgan” hip circles. Nausea began to creep in, a common ailment in labor. Peppermint oil was kept close to inhale to help keep nausea at bay. Seeing that contractions were getting harder, we began filling the birthing pool for K so it was ready when she was. K found comfort laying on her side and leaning on the birth ball in the bed. We worked with L to help give K counter pressure during contractions. As 6pm drew near, another cervical exam was done. K was 7cm, 100% effaced, and baby was still at a 0 station. K decided she was ready to get into the birth pool. She leaned over the side of the birth pool and commented how good the pool felt. L got into the pool for awhile, and then got out to support her from outside the pool. Transition hit soon after entering the birth pool. Contractions were coming every 2 minutes, lasting close to 90 seconds. Small amounts of bloody show would appear in the birth pool with harder contractions, a great sign that pushing wasn’t far away. Around 7pm, K decided to get out of the pool for a bit. For about 40 minutes, she alternated leaning on her birth ball, hands and knees, and laying on her side before deciding she wanted back into the birthing pool. As 8pm neared, K felt pressure and I did a check. She had just an anterior lip and baby was at a +2 station. K decided she wanted me to try to reduce her lip. It quickly reduced. Four minutes later, her water broke and baby was at a +3 station. K got into a squatting position to push. At 818, we could see baby’s head on the perineum with each push. The head was soon birthed three minutes later, followed quickly with the rest of the baby. Baby was brought immediately to K’s chest and the look of joy spread across her face. Welcome to the world sweet Presley, born earth side on September 18, 2014 at 8:22pm, weighing in at 6.6#, 17.25″. She is so loved by her big brother. It was a blessing to serve this family.